How have associations fared over the last year? Well according to both our Small Membership Survey Report and Membership General Incorporated’s recently released 2014 Membership Marketing Benchmarking Report, more than 50% of membership organizations saw growth in 2014. At the same time, both reports also identified a lack of member engagement as a critical factor impacting the majority of associations. And in addition, communicating member value remains one of the biggest challenges to growing membership. This year, the sixth annual edition of the Membership Marketing Benchmarking Report “explores the membership marketing initiatives and outcomes of 865 participating associations”, the majority of which have between 1,000 to 5,000 members. It offers a wealth of information and insight, as well as year-over-year comparisons of "the strategies and tactics that membership organizations use to recruit new members, retain current members, and reinstate lapsed members." With regard to your association, what keeps you up at night? The frustration with our poor member database and the ensuing lack of market analysis/strategy. Juggling lots of programs and activities on low resources. Lack of sound business-based strategic planning/analysis/ review, from board level downwards. Attracting and retaining new and young professionals into the organization. If there was one hurdle you could remove to make your association run smoother, what would it be? A database that was built with membership needs in mind, which is one manifestation of silos in our association. Major decisions are made without having membership at the table. Better communication plan to keep people engaged. We have so many great ideas; we just can’t ever seem to make them happen in a timely and efficient manner. 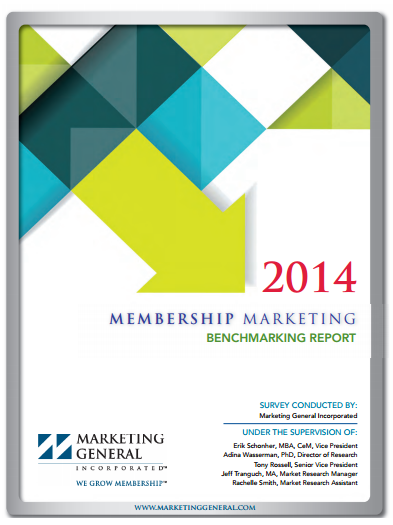 Want to read the full 2014 Membership Marketing Benchmarking Report? If you’d like to read the entire 68-page report, you can download it here: 2014 Membership Marketing Benchmarking Report. Want insight into Small Membership Organizations? In addition, if you’d like insight into small membership organizations, you can download our 2014 Small Membership Survey Report here.